I received a copy of this a year or two ago in exchange for an honest review. I'm sorry it has taken so long, but I've thumbed through it with longing on multiple occasions. I declared 2014 to be the year of food in jars! If Marisa McClellan wanted to consider another profession, I think she would take easily to perfumer. Her flavor combination ideas just in this book alone make me want to try every recipe and stock my pantry with little batches of goodness. You get the idea. I've had some of these recipes marked for a year and finally had a chance to make the Vanilla-Rhubarb Jam, and instead of Earl Grey I used my Reading Envy tea which is part Earl Grey, part coconut. This is a lovely light but intricately flavored jam! I've been putting it on toast this week but will bring it to work in the form of oatmeal jam bars. 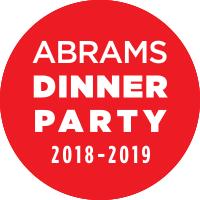 The recipes in this book include directions for small batch canning, but the recipes aren't in great quantities, so it is just as easy to consume what is made. The idea behind small-batch preserving is to eat some, save some. Many of the recipes could also be frozen. If canning intimidates you, you could either simply not do those steps or allow McClellan to instruct you in your first attempts. Just a personal note: Marisa McClellan is the sister of Raina Rose, a singer-songwriter from Portland who I first encountered on the streets of Memphis (during an art walk) and lives in Texas. It's a small world out there in internet land, and I had followed both before knowing they were connected. This is just a non-sweet version of the shortcakes I posted yesterday, since they were a great success. They don't exactly taste like biscuits but still pretty close, more biscuit-like than English muffin-like. These are flatter; I used the same recipe and baked it in four 6-oz ramekins with vertical sides. It was pretty hard to get them out without breaking; perhaps next time I'll just draw some circles on some parchment paper and do it that way. And there will be a next time. The insides of breakfast sandwiches are already so easily low-carb, we were only missing the outsides! Combine dry ingredients, and mix in the wet ingredients. 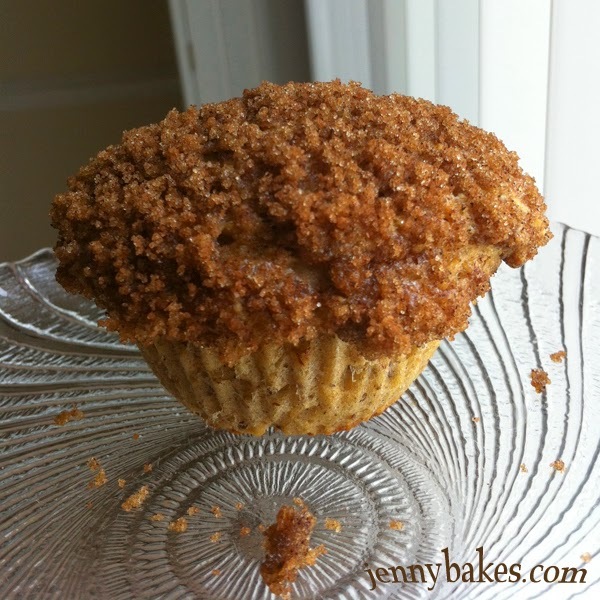 Scrape batter into greased muffin cups, ramekins, or spread in small circles on parchment paper. Bake at 375 for 15 minutes. Makes 4-6 biscuits depending on your container and size. Gently split in half to use for a breakfast sandwich. Strawberry season is almost a month late in South Carolina, but as soon as Swamp Rabbit Cafe started selling strawberries from Beechwood Farms, we were there buying a gallon. Combine coconut flour with baking powder, salt, and Splenda. Make a well, and pour in melted butter, eggs, and vanilla. Pour batter into greased muffin cups. Bake at 375 for 15 minutes. Makes 6 cakes. Nathaniel brought home Bob's Red Mill Low-Carb Baking Mix, so I made one of the recipes off the back to give it a try. It wasn't free, so this isn't a plug or a review. I couldn't bear to have "just muffins," without a flavor other than "muffin." So I added cinnamon to the dry ingredients and made a low-carb streusel with brown sugar Splenda and cinnamon for the tops. These were decent as low-carb baked goods go, I just wish I had a better sense of what else I can do with the mix. I'm not sure exactly what it can substitute for. The texture of these muffins weren't any better/worse than some of the paleo banana bread I have made in the last year. Which means you can use the mix instead of starting from scratch, but I'm not sure it is as cost effective. For the second day of ramp experimentation, I sauteed the last bunch (stems and leaves), then added to scrambled eggs and goat cheese. 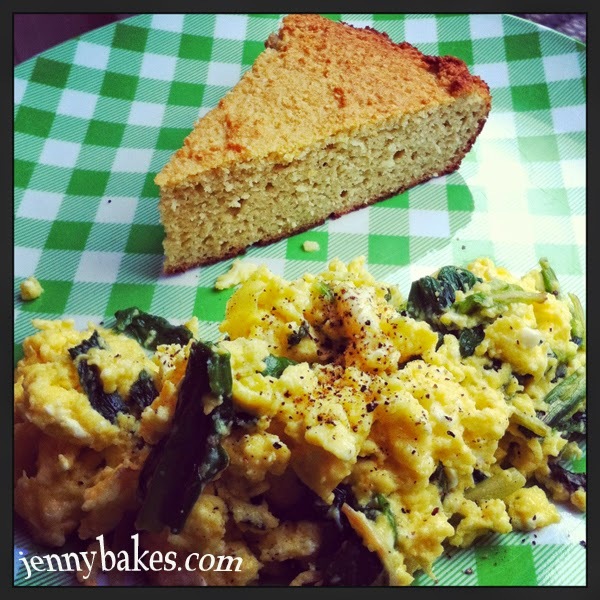 Since this was dinner, I decided to try the mock cornbread recipe from The Paleo Chocolate Lovers Cookbook. The recipe is all almond and coconut with a few other ingredients. It was pretty decent for two people who just don't eat most breads anymore. It was a nice addition to a very springy meal, despite the rain outside. I got this cookbook as a gift, so there is no disclaimer needed, except to say this is where you go for the recipe. I need to experiment a lot more with this one! And of course somehow I made the only non-chocolate recipe in the entire thing. The author claims you can make french toast out of this cornbread but I'm a skeptic. Maybe I'll try it next time! For several years now, I have been on the hunt for ramps. Foodies and bloggers would rave about them and I would hear how they sold out from the farmer's market by the time I arrived, or they'd be available at my local market for such a short time that I'd either miss it or the selection remaining would be too wilted for any good. THIS YEAR I KNEW I WOULD FIND THEM. And I did! A local market that I seem to spend a lot of time at lately, the Swamp Rabbit Cafe & Grocery, posted a picture of ramps right around closing last Saturday, so you'd better believe I was at their front door at 9 AM on Sunday! Nobody else was pounding down the door to get to the ramps, but better safe than sorry. I picked up three bunches to experiment with - two to make ramp gnudi and one to use with eggs. What are ramps? 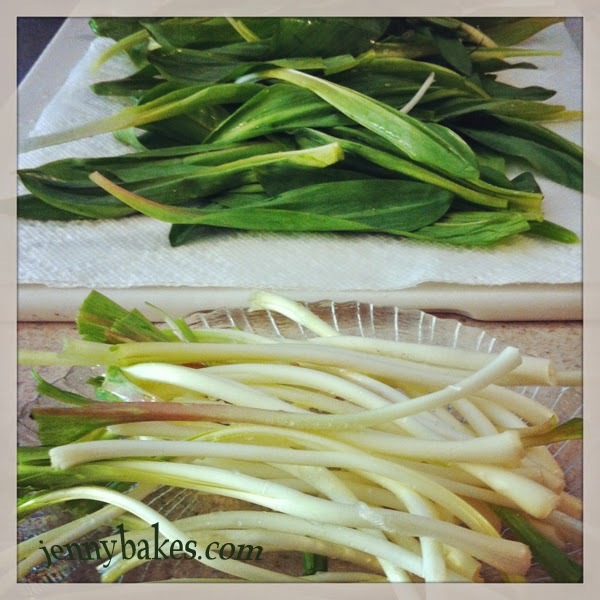 Ramps are a variety of an onionlike vegetable that grows in the wild. This requires it to be foraged and resold for them to end up in my hands. You can eat the leaves, the stems, and the bulbs, but the picture you are seeing above is after extreme cleaning. The bunches I picked up were caked in mud and the bulbs were covered with a protective skin. The recipe instructs you to save the stems and bulbs for another purpose, but I couldn't fathom not making this dish as rampy as possible. So I sauteed them in some olive oil, and served the ramp n' ricotta gnudi with the ramp stems/bulbs, also drizzled with local truffle olive oil. The flavors of spring! It tasted pretty good, but I have a weird texture issue with anything dumpling like. I probably wouldn't make them again but my husband liked them! 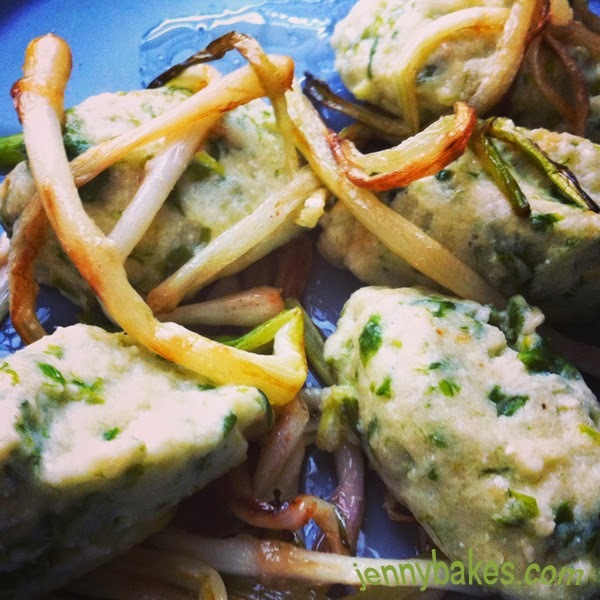 Still, I'm just happy to finally get a chance to experiment with ramps! In my gluten-free baking experiments, I admit that my brain can more easily wrap around the lesser complicated recipes! Especially during the week, I just don't to try that hard. 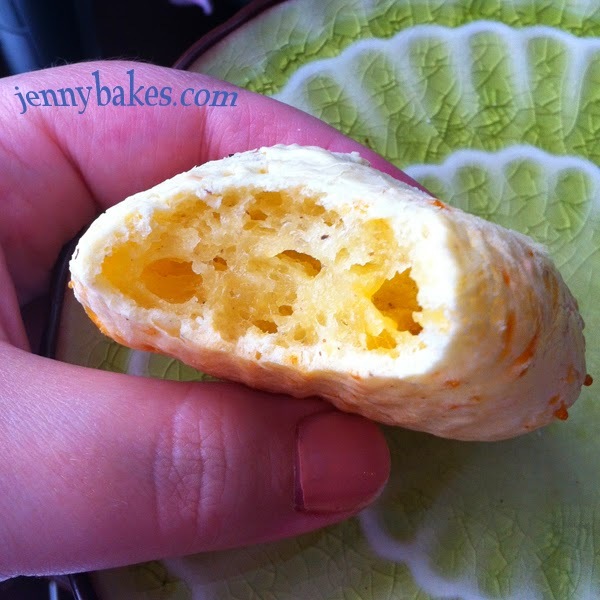 I was intrigued by the Brazilian Cheese Puffs recipe. I keep seeing a similar baked good at a local cafe, but had not tried one. I was also curious what a recipe that relied on tapioca flour would taste like! You can see how chewy these are by the inside structure. That's the tapioca, which is similar to or exactly like yuca or cassava. They were chewy and I mean chewy. Chewy chewy. Not so much a bread as ... hmm, what is a good example of something chewy? I found it a bit disconcerting to eat them on their own. Also they heat up in 3-4 seconds in the microwave; any more time than that and they were red-hot. This is another recipe from Gluten-Free Bread, which I got from the publisher in exchange for an honest review. It's taking me a while to work my way through it so it will make a frequent appearance for a while! But, you know, full disclosure. I was sent a copy of this cookbook by the publisher in exchange for an honest review. It has taken me forever to post anything about it because of the difficulty of gathering ingredients. That isn't the publisher or the author's fault, just a truth about gluten-free baking. I will post several recipes linked to this book, because it has a wide scope of quick loaves, yeast loaves, and unique breadlike creatures. The introduction section is very useful and explains the function of each of the ingredients, which are legion in most of the recipes. 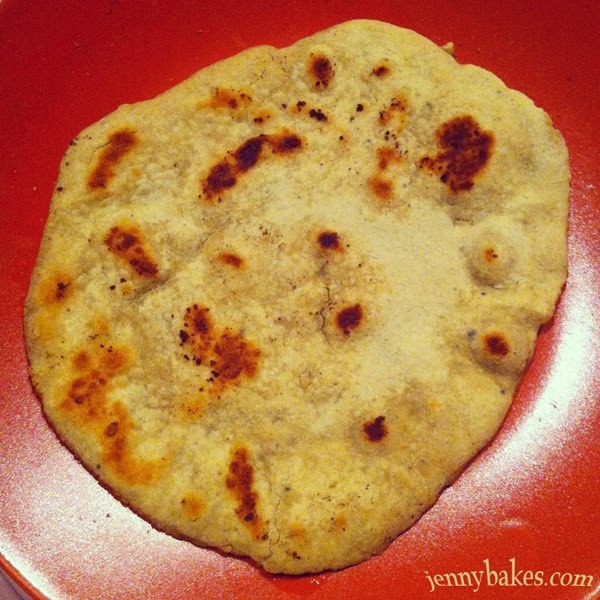 One of the simplest recipes is what I tried first - chapatis. I started there because I already had chickpea flour in my pantry, probably from making socca or fritters. Chapatis, an Indian flatbread, tend to be made with wheat or whole wheat flour, which of course relies on gluten to hold together. Making them just from chickpea (aka garbanzo bean) flour was a greater challenge, and I had to really use a light touch with extra flour on my hands to flatten them and prepare them for pan frying. The flavor of chickpea flour would make these a nice accompaniment to Indian food as it is traditionally enjoyed, but also Mediterranean or Caribbean - really anything with interesting spices! 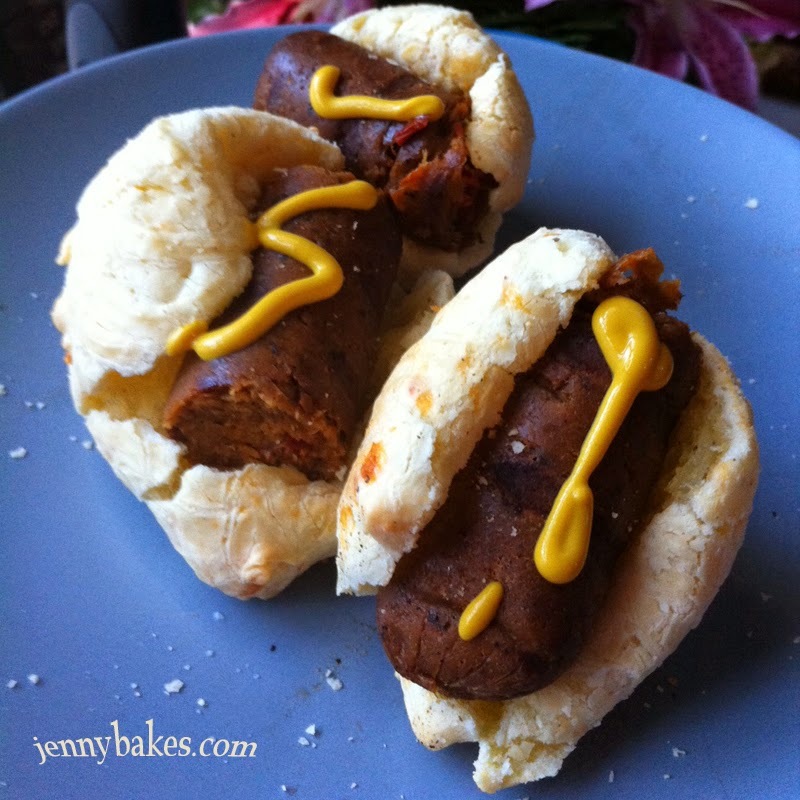 This was a recipe that also just happens to be lower-carb, so I will probably make this again. It is my non-professional opinion that anyone who doesn't need to eat low-carb, low-sugar, gluten-free, or paleo would never do it because the ingredients are so expensive, difficult to track down, and you need so many of them! I don't need to eat gluten-free, knock on wood and thank goodness. 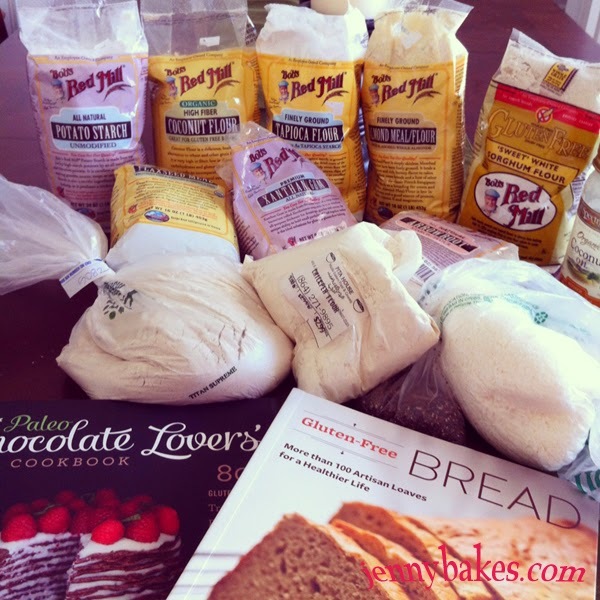 But I have friends who do, so I jumped at the opportunity to review this Gluten-Free Bread cookbook. This explains the potato starch, tapioca flour, almond meal, sorghum flour, flaxseed, xantham gum, arrow root, chickpea flour, chia seeds, and rice flour. Phew. See, you need a combination of things to make up for what wheat flour does on its own. I had grand plans to bake a bunch from the book at once and bring to my GF friend when she had surgery, but it took so long to find all the ingredients I've only managed a few experiments so far. I'll post about them in the next few days, and continue doing so as I try things out. This won't be the first time I've made something from Momofuku Milk Bar in this blog. Last June, I made their recipe for Cornflake-Chocolate Chip-Marshmallow Cookies. Since then we have splurged and ordered their compost cookies from Goldbely. I didn't set out to make another one of their recipes! But I had been making a lot of recipes that called for egg whites and was determined to not just toss out my egg yolks after they were forgotten in the fridge. I found an amazing list of what to do with egg yolks, sorted by the number of egg yolks you had. I've always heard about Crack Pie, and I had the other ingredients on hand, so it was an easy solution. 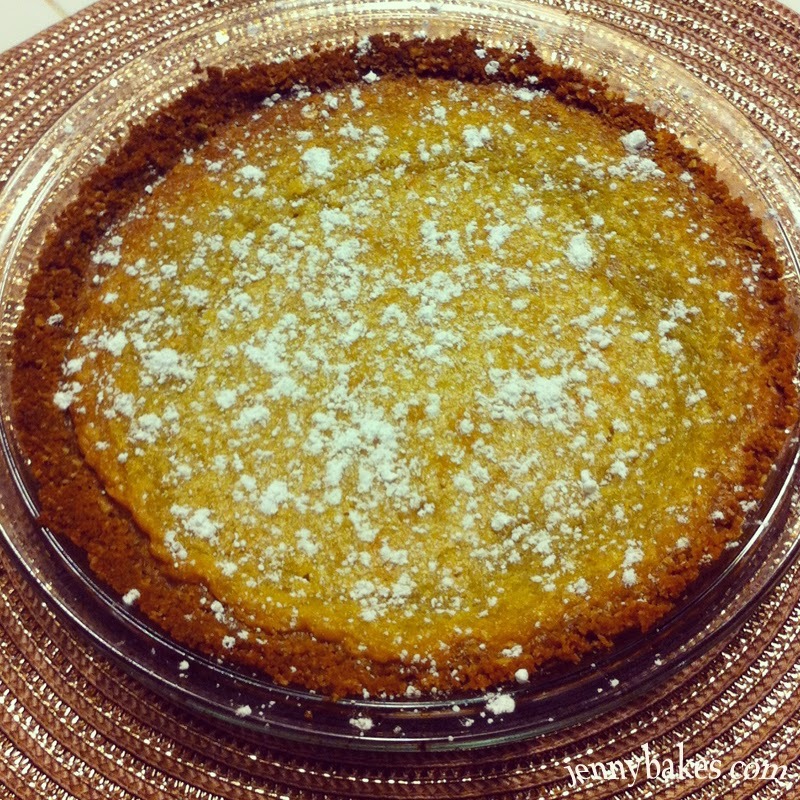 There are a handful of slightly varying recipes for the Momofuku Crack Pie around the internet. I used the recipe as printed in the LA Times, which made two pies and used eight egg yolks. I knew I could bring them to work and they would be eaten. What exactly is crack pie, since that only describes how addictive it is? If you imagine a pecan pie filling with no nuts, but then tempered with milk and a cookie crust, that is what a crack pie is. It is one of their standard offerings. It isn't pretty to look at but if you know what you are in store for, it doesn't matter. Since the internet has everything, you can watch the pastry chef herself make this recipe. We had a goodbye party for a co-worker, and I made cakes! 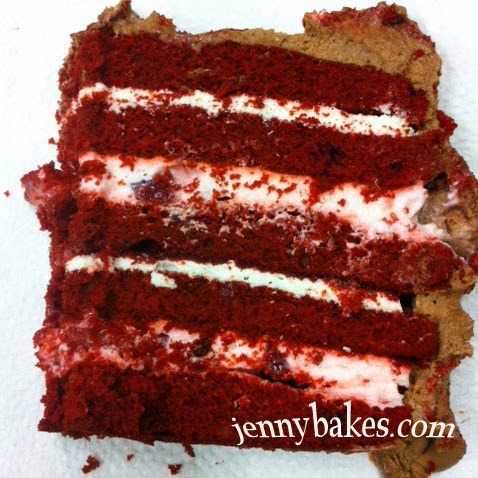 I didn't want to bring something I'd already made, so I scanned the cake recipes I'd pinned to my Recipes to Try - JennyBakes board and picked two. 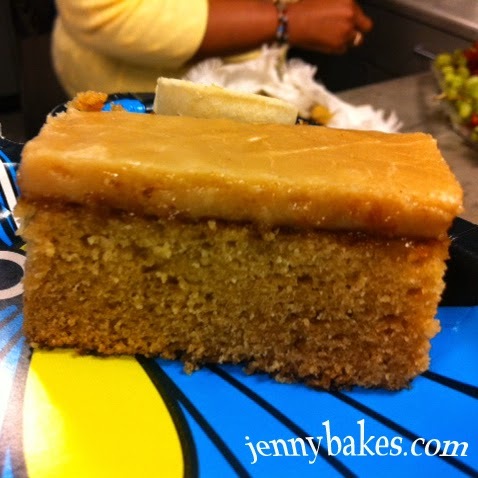 One was this luscious and easy peanut butter cake from The Girl Who Ate Everything. You can ignore the part about using it to get pregnant. The sheet cake bakes in 15 minutes and the icing cooks quickly. I'm not sure I've made anything easier and it was really delicious. Filing this one away for the future! If you make it, you might want to make sure people know it is peanut butter and not caramel cake - it sure looks like a caramel cake. It messed with taste bud expectations a bit for my very southern co-workers! The other cake took far more effort. I based it on the Red Velvet & Raspberry Supreme Cake from Sweetapolita, but I used strawberries instead of raspberries, and didn't have enough to put on top. From the outside, this cake looks like it might be simple. Inside, the red velvet cake layers alternate with two different fillings - one is a pink whipped cream that has berries folded into it, and the other is a marshmallow cream cheese filling. It was a lot of work and I think the two different fillings weren't different enough to have made the effort worth it; but both of them were good. I think I'd prefer the marshmallow cream cheese with a peanut butter cake, or a rich chocolate cake. 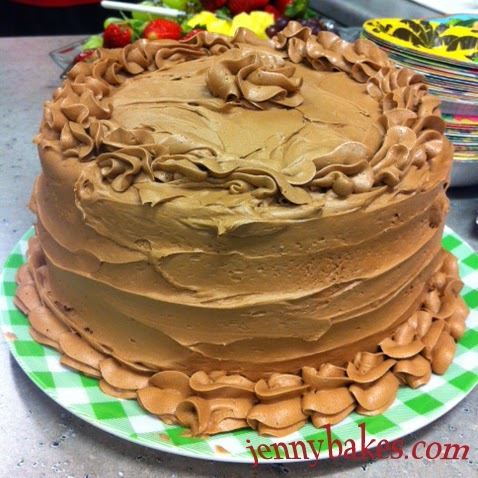 I was tempted to leave the chocolate frosting off and just let the layers speak for themselves, but I think that was one of the best parts of the cake. I apologize for my messy decorating - I had spent four hours making the two cakes and was exhausted so I just called it good!